Higher total amount of intensity in precursor spectra indicates a stronger MS1 signal. The Total Ion Current includes contributions from peptides, contaminates, and noise. Total Ion Current is only calculated during the "Retention Spread", the time period when most peptides are eluting. Higher: Stronger signal makes it easier to detect peptides. 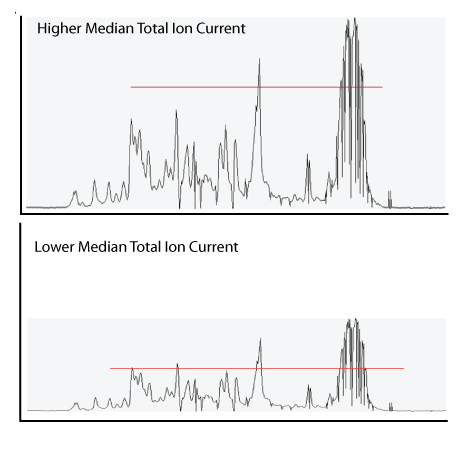 Too little Total Ion Current means that little signal is getting to the MS. Little signal means it is unlikely that peptides will be detected. Too high Total Ion Current may mean that too much sample was loaded, or that there is a lot of contamination. The Total Ion Current is the total absolute signal available for peptides (and contaminants and noise). The Peak Intensity is one measure of how much of this ion current is devoted to peptides. The MS1 Signal to Noise gives another indication of how much of this total ion current is useful peaks. High Total Ion Current without a similarly high Peak Intensity may indicate contaminants. A high Total Ion Current will usually mean the the ion trap gets filled quickly so that the MS1 Ion Inject Time should be low. If it is not, that could indicate a problem.